I left Mexico. 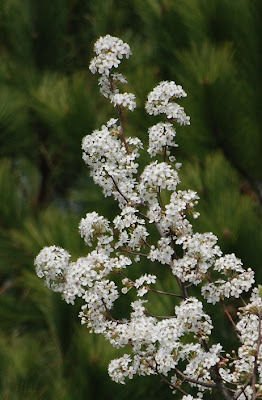 But before I write more about my stay there, to start this post there is a little clue about where I might be now. 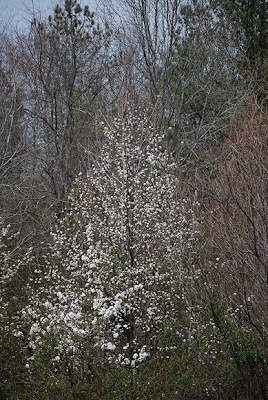 For those who did not get it on the first try, another shot in the woods. The trip to Mexico City was more cultural than usual. First, I managed to visit all the halls of the Museum of Anthropology. That is, I finally recovered from the shock of my very first visit to the city when half the rooms where closed in particular the Maya one. But as luck had it, business had me for a full day at the famous UNAM of illustrious trajectory, from the Olympic games and the Tlatelolco massacre to the current controversy about the UNAM students that happened to be in the Reyes camp when that one was bombed by the Colombian army. Now, I do not want to get into the grit of this, but how did these students got to the secret camp of Reyes? Needless to say that as I visited Mexican public opinion got suddenly aware of what the FARC meant on how it pushes its sick tentacles inside Mexico, and the UNAM. But the UNAM today is a splendid campus. Perhaps not as neatly conserved as some famous US colleagues, but infinitely better conserved and organized than the Caracas UCV. The contrast is just almost unbearable as we see how Venezuelan successive governments have sort of abandoned the UCV even as this one has been declared a World site. Now, under the current administration the UCV body is in direct confrontation with the state and the consequences can be felt, including shooting of the students by forces as evil as the ones that shot the UNAM students that were at Tlatelolco square, under a PRI administration that tried to project a leftist liberal image to the world, just as the Chavez pantomime. The UNAM today is, as I could observe through privileged work reasons, an active campus, with a dynamic research. Perhaps not as high tech as much better endowed universities up North but up to date enough to offer its brightest students a chance at a real academic career. The college I visited had a good atmosphere, students looking like students, spending their break on the well tended grass fields. If the buildings show a little bit of aging, they are clean and not run down the way we see many buildings at the UCV in spite of its best efforts. Simply put, maybe the Mexican government does not give the UNAM as much money as it should or that one would like to receive, but I have a clear idea that the UNAM gets proportionally much more from the Mexican system than what the UCV gets from the Venezuelan one. And certainly the UNAM staff cannot be accused of being close to the Mexican ruling class..... I also sensed that faculty at the UNAM was more accountable to results than the one at the UCV, but that is another discussion and even if chavismo is right in pointing such "productivity" problems, its offered solutions are not solutions and will only aggravate the problem of the decaying level of Venezuelan higher education. But there was more to surprise me. First, the campus had a neat system of free bus to go all around Campus. And it works because traffic is kept in check, illegal parking is near inexistent and work study students (?) directing crossings and circulation is impressive. I will remind the reader that Mexico is also a Latin country, as messy as any other one but yet when they want they can establish enough order to make life enjoyable for all. This concept under chavismo has become totally alien to our society as we are slowly descending in utter chaos. Read the latest example narrated by Miguel where students are too worried about occupying space even if this implies a "burnt earth" strategy. 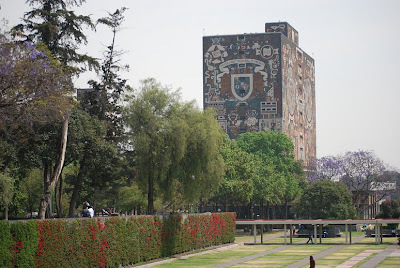 This profusion of book stores in addition to one of the most famous library buildings (picture above) is no accident: the UNAM is indeed a center of culture and it reeks of it at every corner. Just a look at its web page will dazzle you by all the cultural activities offered which by themselves are infinitely superior in quality and quantity than all that Venezuela has to offer these sad days where creeps like Farruco Sesto preside over the regimentation of Kultur! This last picture resumes in a way the surprisingly placid outlook of the huge UNAM where business seems to be to think more than to make politics. Even though Mexico is still not out of the Obrador accusations, you would never have guessed it from a UNAM visit. 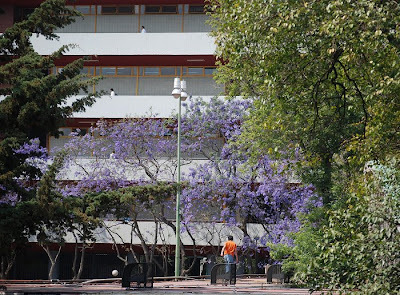 Even if the UNAM is a world on its own, a large city with all its services and problems, it functions, it looks to the future and is not immersed in navel gazing and acrid recriminations. But chavismo is clearly not interested in such a campus style: here campuses are to create the new Venezuelan man through political education. Technical education and critical thinking can take a back seat for the time being. We are going to pay this dearly. Meanwhile the UNAM can manage highly skilled professionals and dreamers wild enough to join the FARC. That tells you all. 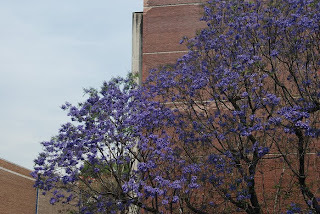 And yes, I have been totally enthralled by the blooming jacarandas, I shot dozens of pictures just of them. But I think that three are enough for a single post.